The calendar shows tomorrow as being the Full Moon, which is deceiving from a practical standpoint. Because the moon becomes 100 % full (100 percent illuminated) just after midnight tonight. Which has it just into the wee minutes of tomorrow as far as the calendar date is concerned. But tonight is effectively the night of the Full Moon. 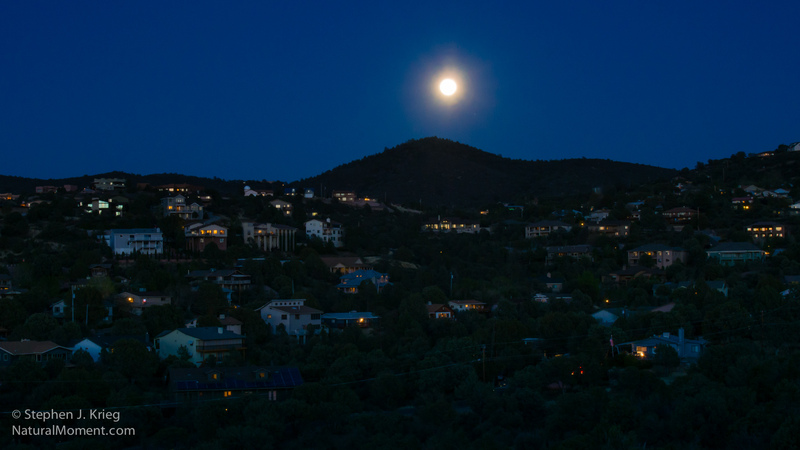 Here is how it looked as it rose over the Bradshaw Mountains on the southeast edge of Prescott at dusk this evening. Ah, it was that special time of month again: the Full Moon. I revolve around it. The event, I mean. I watch it build daily from New Moon, rising later and later each day, until finally it rises at sunset time. That’s why it’s full then: it’s exactly opposite the sun, reflecting its light off its otherwise dark, barren surface. I especially like scenery photos with the moon in them. However, you have to include the moon in them while there is still enough daylight on the scene. Otherwise you have yet another boring pic of the black sky with the bright moon as a little circle in it. We sure don’t need any more of those. Next time: how to use a fantastic app called The Photographer’s Ephemeris to help you plan your moonrise and moonset shots. Photo location: Chino Valley, Yavapai County, Central Arizona Highlands. Last night as I was approaching home, and the sunset hour, I could tell it had the makings of a spectacular one. The clouds were crazy patterned against the blue sky north of Prescott. Sometimes good looking sunset clouds move on or dissipate before the sun sets, but it didn’t look like that would happen this time. It pays to observe and be ready. After stopping for several shots and some video, including “Grassland Skies”, I still had time to shower and wait for the sun to do its thing. Because I have a wide open western horizon in my back yard. The clouds were not far above the horizon, rather than shutting off the sunset. So they would do their job as reflectors just after the sun had slipped below the landscape. But in this case, they also radiated out to the south, east, and north. What a killer combination of conditions. All I had to do next was watch and photograph. As the recently departed sun’s fire lit up the clouds from below, I made a panorama series of four overlapping shots. That allowed me to merge them in Photoshop for one extremely high resolution final image, rather than taking a single super wide angle shot and cropping it heavily. 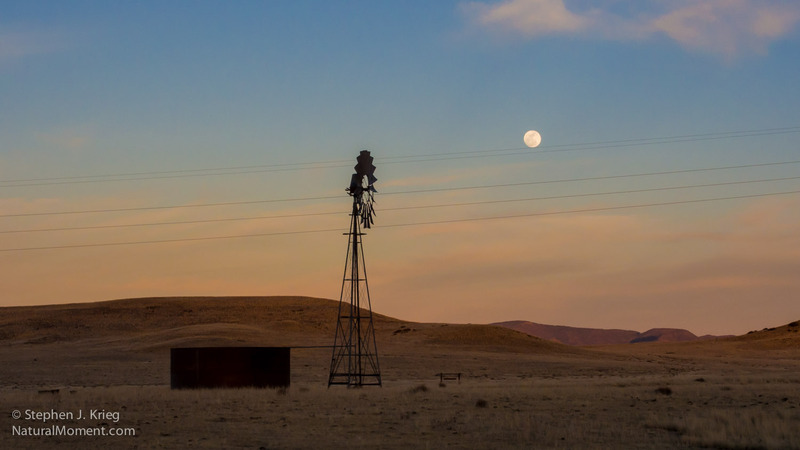 Photo Location: Chino Valley, Yavapai County, Arizona. Old Highway 89. Old railroad bridge, rails gone. Railroad ties gone. 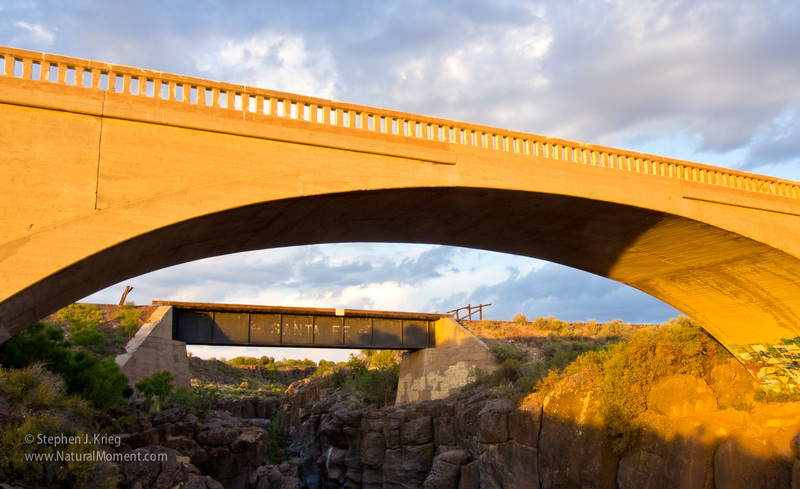 Graceful spans in the sunset, a trickle of the Verde River below. After the big monsoon thunderstorm up north, Chino Wash was awash with muddy water. The only kind of water dry country drainages seem to know. It’s either there, or not. And not for long. 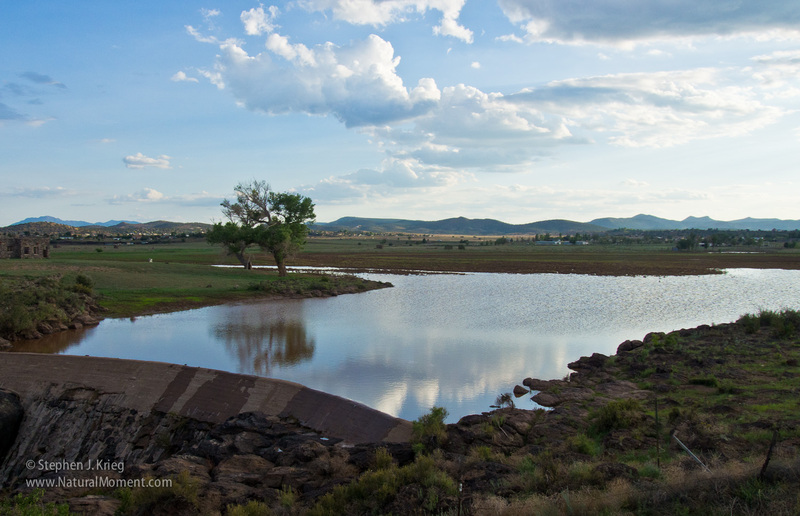 The little dam that forms Sullivan Lake at Paulden, Arizona was built by the Works Progress Administration in 1938, 75 years ago. It wasn’t thrown together at any old location. It’s the head of the Verde River, where the drainage has cut a small, vertical gorge through the malpais basalt rimrock. Plenty of basalt boulders to use in the construction, as well. A few days after the big rain, the water was barely flowing over a portion of the right side of the dam. 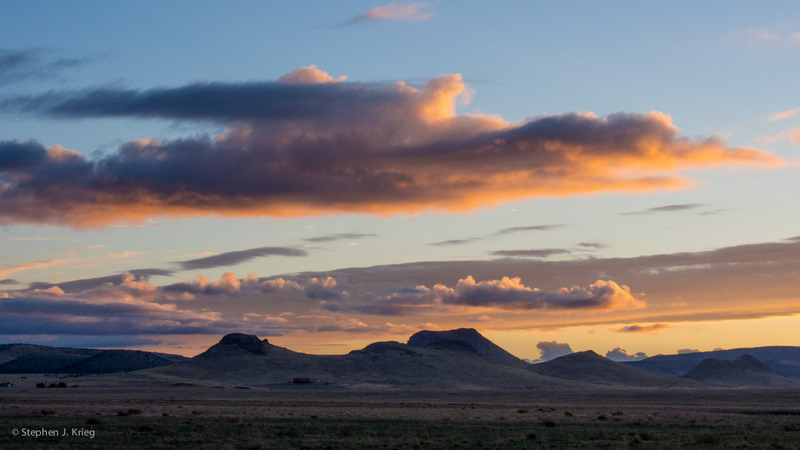 The rapidly greening Arizona Highlands grassland was vibrant in the evening sunlight. The water was still muddy, but reflected the blue sky quite nicely. 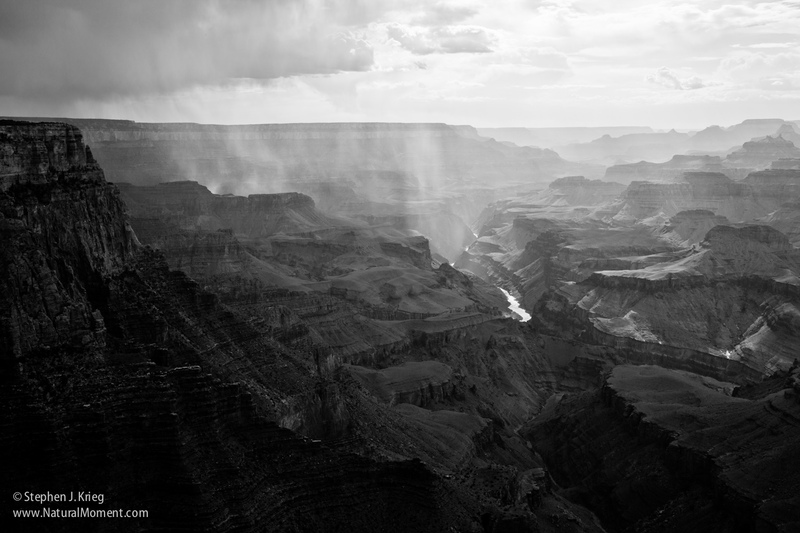 Photo Location: Paulden, Yavapai County, Arizona. 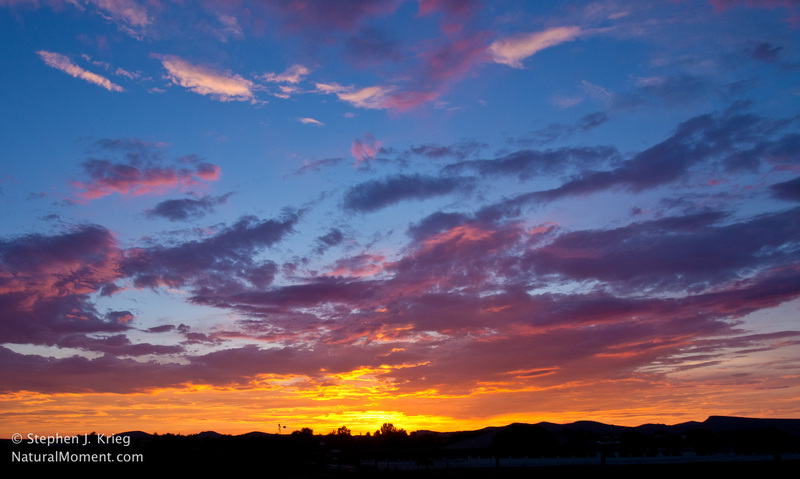 The wide view of yesterday’s sunset photo, shifting one’s attention from the blazing yellows and oranges just above the sun outward to the pinks and purples of the upper clouds, and the blue sky canvas. Photo location: Chino Valley, north of Prescott, Yavapai County, Arizona. I was hiking up Loy Canyon in the Red Rock-Secret Mountain Wilderness west of Sedona. I had gone from high desert valley floor vegetation of Pinon pine and juniper, up into the Ponderosa pine zone, then back into dry, tough manzanita on a high south slope. I was almost topping out on the point of the ridge I came to call Hiker’s Perch, when I came face to face with this Yucca plant on the uphill slope above the trail. 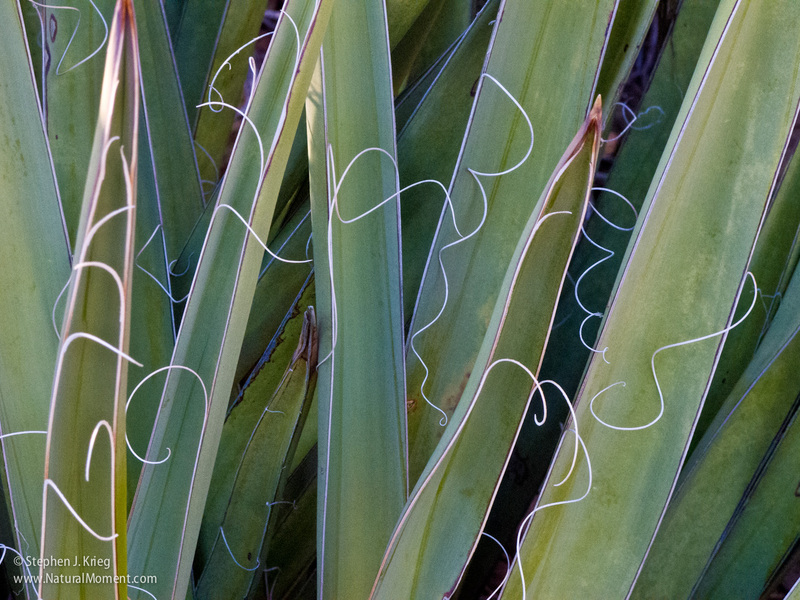 The many species of Yucca are favorites on my plant list. This one is the Banana yucca, so named because of its banana shaped fruit pods that appear early every summer. Its green-blue blades are strong, with needle sharp points. You don’t blunder up against one more than once, unless you enjoy punctures in your legs. Their blades spread out at various vertical angles, and growing from a common base this form serves to direct rainwater and snowmelt toward the plant’s roots. Pretty clever. What especially captivated me about this particular individual was the bright but soft high desert light on it, there in the shade of a big manzanita bush. The tough, sinewy fibers curled off the blades in enticing swirls. I made several exposures before continuing on. Red Rock-Secret Mountain Wilderness, Coconino National Forest, Arizona.